UPDATED: Fri., June 1, 2018, 10:09 p.m. Deer Park residents voiced concerns and shared questions about health care, budget reform and education with U.S. Rep. Cathy McMorris Rodgers during a town hall event on Friday. The discussion was held at the Deer Park Public Library and drew about 30 people. McMorris Rodgers opened the event by sharing her work on the Resilient Federal Forestry Act, efforts to open a 24-hour urgent care clinic at the Mann-Grandstaff VA Medical Center in Spokane after its emergency room closed, and expanding the ABLE Act, which created tax-exempt savings accounts that can be used for disability-related expenses. Supporters of the Resilient Federal Forestry Act, which passed the House but not the Senate, said it would cut red tape, allowing for swifter action to prevent wildfires. Opponents said the legislation would limit environmental review. McMorris Rodgers said town halls are integral in connecting with residents. Last year, McMorris Rodgers was dogged by criticism that she held only one large, traditional town hall meeting. She responded that she preferred to meet in more productive, smaller groups or hold telephone town halls. This year, she’s held seven “Conversation with Cathy” town halls, but some supporters of her Democratic challenger, Lisa Brown, have argued that the events tend to be at inconvenient times for working people. A questioner asked McMorris Rodgers if she plans to schedule a large venue town hall debate on a Friday evening or Saturday that will allow working people to attend. 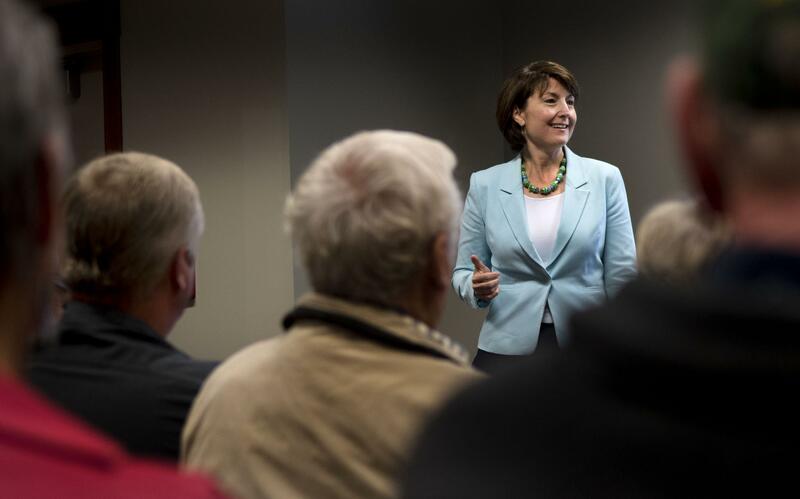 McMorris Rodgers said she holds town halls in venues of all sizes during varied hours. One Deer Park resident spoke to McMorris Rodgers about the cost of medical insurance after the repeal of the Affordable Care Act. He said his cancer medications would be $15,000 a month without insurance. “I want you to know I believe both in policy and personally … We must protect those with pre-existing conditions,” she told the resident. “One of the things in the Affordable Care Act that I have said needed to happen – and remained firm on – that those with pre-existing conditions must have a guarantee they will be able to get health insurance. Brown supporters have noted that McMorris Rogers voted last year for the American Health Care Act, which would have allowed insurers in some cases to charge more for insurance to people with pre-existing conditions, a provision that critics said could have made plans unaffordable to some. Another resident asked how the federal budget will be balanced with social programs and the new tax plan that went into effect in January. McMorris Rodgers said while Social Security and Medicare are excluded from the $1.3 trillion budget appropriated by Congress, there are outdated programs that need to be reviewed. A retired teacher asked McMorris Rodgers if she supports instructor training to help students with various learning styles as well as programs for students who want to pursue a skilled trade. McMorris Rodgers said a priority is for students to have an option for vocational training in their high school, as well as individualized education. McMorris Rodgers said it’s her goal to have constructive dialogue with voters. Published: June 1, 2018, 9:52 p.m. Updated: June 1, 2018, 10:09 p.m.